For basic maths skills, try this awesome crossword puzzle, with a twist. It includes counting, adding, subtracting and spelling all in one! Help Max go fly a kite (up to the highest height) by completing these subtraction problems. For each problem on this year two maths worksheet, kids subtract numbers under 10 to see how many lollipops are left after someone has had a tasty snack. Add some colour to these Christmas presents in this colour-by-number mental maths worksheet. Kids will exercise addition and subtraction skills. Subtraction can be a tough concept to master, but with these simple picture problems, you can give your kindergartener a leg up! This worksheet gives your young maths explorer the opportunity to dig into basic subtraction skills while counting some stegosaurs. Counting and subtraction come together for a colorful and animal-themed maths worksheet, great for visual learners! 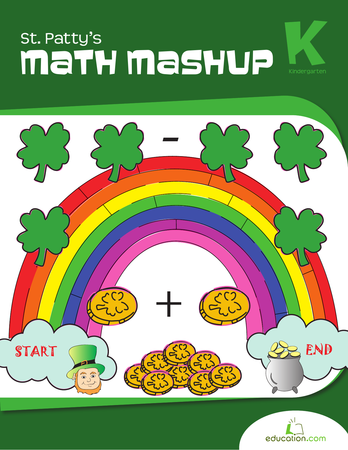 Get into the spirit of St. Paddy's with some shamrock subtraction! Review addition and subtraction concepts by matching up the like equations. Try your luck with this colorful collection of St. Patrick's Day maths! practise counting and writing numbers. Then make the leap from counting to adding and subtracting, with picture equations. Number writing combines with pictures and counting to make beginning subtraction more bearable and interesting for your child this spring! Go wild for subtraction! These simple story problems are just the ticket for helping your maths whiz master subtraction. Can you subtract all the veggies in these equations? 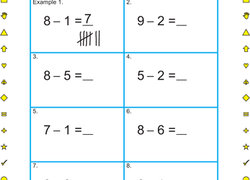 practise simple subtraction with your kindergartener. Give your little turkey mental maths practise with a Thanksgiving addition worksheet. Kids will use Thanksgiving icons to add up each equation and find the sum. These drawings need some colour to liven them up. Students will colour the pictures while honing their maths skills with this addition coloring worksheet. Here's a colorful set of drill sheets for kindergarteners who are ready to learn about subtraction. 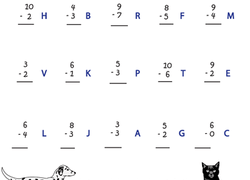 This year two subtraction worksheet will help improve your child's maths skills, while giving him a fun riddle to solve. Help your kiddo reach for the stars with this subtraction practise worksheet! For each problem, colour in the star with the correct answer. Treat your little sweetheart to a fun maths activity this Valentine's Day. He'll get to do some coloring as he reviews maths facts. Suit up for stellar subtraction! Have your little astronaut count the space suit parts in the boxes and subtract the darker pictures to solve the problem. Practising subtraction is simple. All you have to do is count the total number of shapes in each box then take away the darker shapes. Don't let your first grader lose her maths skills over winter break! 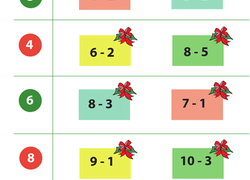 Indulge in Christmas subtraction, along with those holiday sweets and toys.